The age listed in the passport was 26. The man who presented the document to security officers at John F. Kennedy International Airport was 40. His face bore only a passing resemblance to the photograph. Yet, Luis Guaman cleared security without incident last month and boarded a plane for his native Ecuador using an Ecuadoran passport in the name of Segundo Castro. His escape from the United States not only became a headache for investigators who have charged him with murdering a woman and her son in Brockton, but it starkly highlights a weakness in American airport security. But while the Department of Homeland Security has created layers of security to keep weapons and terrorists off planes, aviation security specialists say it is still far too easy for someone with a stolen passport or faked identification to get through security while departing from US airports. It doesn’t mean that airplanes are more vulnerable to attack, aviation security specialists cautioned, because all passengers are searched and questioned and their bags are scanned. Still, the specialists said, passports and other IDs are a security issue that could be exploited by terrorists and other criminals trying to hide their identities. Currently, TSA agents have few tools for reviewing the documents, and must check hundreds of passports by hand with the aid only of magnifying glasses and blacklights. Ultimately, they rely on their eyes — and training in basic facial recognition — to compare travelers’ faces with passport photographs that can be years old. Al Felzenberg, a lecturer at the University of Pennsylvania and Yale University and former spokesman for the 9/11 Commission, said it is difficult to assess the risk posed by those using fraudulent documents. But he believes that using such biometric identifiers as fingerprints to verify the identity of people leaving the country would minimize the chances that terrorists could use faked documents to board planes. The 9/11 Commission recommended the use of biometrics, like digital fingerprints, photographs, and retinal scans, to screen people entering and exiting the country, to verify travelers’ identities and keep track of how long they stayed. The names and birthdates of all passengers flying in and out of the country are collected by airlines and checked against the FBI’s watch list and no-fly list, which includes the names and aliases of suspected terrorists. Also, under the US Visitor and Immigrant Status Indicator Technology system, which has been gradually phased in since 2004, the Department of Homeland Security collects digital fingerprints and photographs from most non-US citizens when they apply for a visa or arrive at the nation’s airports and other entry points. Each time they enter the country, those prints are run through a massive law enforcement database to weed out suspected terrorists, alleged criminals, or illegal immigrants. Congress had mandated that the agency implement a biometric screening system by the end of last year for foreign visitors exiting the country. But after running pilot programs at a dozen airports and two seaports in recent years, homeland security officials have yet to implement a biometric sytem that tracks visitors when they leave. They have said they are still reviewing it. Passengers boarding planes at the nation’s airports are required only to show their boarding pass and passport, driver’s license, or other government-issued identification to a TSA screener, who checks whether the photo matches the person and uses a blacklight and magnifying glass to verify whether the document appears authentic or has been tampered with. As for how Guaman was able to slip past security with a passport that was issued to a man 14 years his junior who bore little resemblance to him, Soule said an investigation into the matter is ongoing. US Immigration and Customs Enforcement officials said they had no record of Guaman and believe he had entered the country illegally. Guaman boarded an Aerolineas Galapagos flight hours after police had discovered the bludgeoned bodies of his housemates, Maria Avelina Palaguachi-Cela and her son Brian, 2, in a trash bin behind their Brockton house Feb. 13. 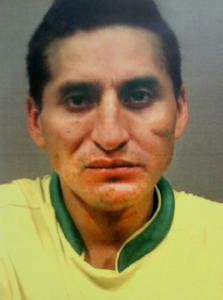 Investigators were seeking him for questioning when they discovered he was in Ecuador. Guaman was indicted in the murder case Wednesday, and state and federal authorities are trying to persuade Ecuador, which forbids extradition of its citizens, to return him to the United States to stand trial. He is being held in Ecuador on a fake passport charge. Last year, TSA screeners caught 200 people with fraudulent documents trying to board flights at US airports, Soule said. It is unknown how many went unnoticed. Richard W. Bloom, an aviation security and counterterrorism expert who teaches at Embry-Riddle Aeronautical University in Arizona, said it was a little worrisome that Guaman was able to pass through security with the passport of a 26-year-old. But he said there may never be a way of making the system foolproof. “Regardless of how good a security program is, there is going to be a base rate of things happening,’’ he said. US Representative Stephen F. Lynch, a South Boston Democrat, said that keeping suspected terrorists from entering the country has been a top priority since 9/11, but it may be difficult to come up with a system that will catch passengers with fraudulent documents from leaving the country that is cost-effective and not too burdensome for all travelers. Shelley Murphy can be reached at shmurphy@globe.com; Maria Sacchetti can be reached at msacchetti@globe.com. Follow her on Twitter at @mariasacchetti.